"If I had a Plan B, I would have used it. If you give yourself something to fall back on, you'll always fall back." HEARSAY: The sound on Trampoline is very different from your previous releases. It's much more 'produced', where something like Short Man's Room was recorded live to eight-track in a quick burst. Do you favour one approach over another? JOE HENRY: Well, I do right now. I'd come to feel very limited by the live studio thing - trying to get six people in a room together and hope everybody has a good moment at the same time. That's kind of like doing live theatre, where mistakes become part of the fabric of the piece, but Trampoline was more like making a movie and I much preferred that. Right now I can't imagine going back to my old way of working. There are certain situations -- like if you're doing a song for a film -- where it would make sense to approach it that way, but I enjoy the process of recording too much. To go back into the studio would be like making a documentary. Right now I can't imagine going back to that idea - it's too much fun to manipulate things. I like drum loops, I like screwing with sounds, I like varying the speed of the tape machine to see what that does to things. I have a studio in my garage now but before I used to have a big pile of songs and then decide what they're gonna sound like and then rally the troops and go after it - it's like putting a bird in a cage. This time I was trying to work in a different way and the recording process was part of the writing process. I'd make a drum loop or a drum machine which had an interesting rhythm to me and make myself write to it, and as I was writing to it I'd be recording the song as it was happening. Many critics have bracketed your writing with the 'K-Mart realism' school of short story writing-people like Richard Ford, Jayne Anne Phillips and Raymond Carver. Are those writers an influence? I like all those people but I'm always quite surprised when I read those comparisons. Two years ago I was in a hotel in Australia and I happened to be reading a Raymond Carver short story and ever since then I've read about myself and Raymond Carver all the time. He's absolutely fantastic but I never discovered him till I was maybe 31 years old so I don't know if he's been that big an influence on me. I think we find a lot of the same stories interesting. I really like the way his writing voice is very flat and dispassion­ate, even when he's talking about dramatic things, and I've always enjoyed that - I think that ages much better than anything that's really emotive and puffed-up. I don't think of myself as being 'literary' - when people say that they're thinking of the lyrics as separate from the music. For me, if it's going to work at all it needs to be a seamless thing. The music needs to influence what the words feel like and vice versa. If I'm making people think of separate things, it makes me think I'm not doing my job well enough. Jane Siberry says she 'sees' her songs visually when writing them. If you don't think of your songs as 'literary', do you take any cues from the visual arts? I certainly do - I've been easily as influenced by film as by other musicians. It's limiting when musicians only talk about people who do exactly what they do. I think it's easiest to be influenced by things which are quite different from what you do coz it's more subversive - you're not so aware of the influence. I go to see a movie and come out crackling with ideas. Even a bad movie can get your mind open and film works like a great song might - images are strung together like bulbs on a wire that have relevance because you put them next to each another, and your mind can jump from fragment to fragment and make sense of it. We've all grown up in the age of movies and we've learned to do that. And we've grown up as listeners to pop music and to songs that work in the same way, even if they're not a linear narrative. I love songs that are just fragments stuck together. I like him but I've been more influenced by Chagall - the dream-like thing of goats flying over the house. I've said in the past that I'd like to get my songs to feel like one of those paintings. If I'm travelling and get to go to a museum or something, I'm always kind of wired the same way as when I go to a movie. Paintings work in a lot of ways like a song works. You don't have to know what's going on to enjoy it. People hear a song and if they think they've figured out what you're talking about it's like finishing a crossword puzzle: 'I can move on now - I've got that one figured out!' When you see a painting, maybe it's a complete abstraction and all you're responding to is shapes and textures and colours and maybe that's enough. Like a photograph when it's murky and shadowy and you don't have to say, 'Well, what's that? Oh, I see... it's a lady's hat.' That's not the point of it! If you see it and are engaged by the composition and the balance then that's as much the point as anything. I always thought of songs that way. You don't have to know what the lyric's about. I frequently don't know what some of my favourite songs by other people are about. I love songs that are specific enough to intrigue you but not so specific you feel you've sucked all the good out of it. I have a healthy respect for the part that mystery plays. I love hearing sounds on a record without having to know what made that sound. I'd sooner not know. Trampoline is full of mysterious and unattribut­able sounds. A lot of things happened that you'd never imagine. My son has a baby accordion and at the beginning of Bob & Ray we were working with a tape machine that would run double speed, up and low, so were running the speed of the tape an octave faster. The song was going by like Alvin and the Chipmunks. When we brought it back to normal speed, it sounded like a harmonica that was about this big [ performs quintessential 'look at the size of that' angling mime] and rich and textural and great. When things happen by accident you have to figure out what it does to the song. From that one part you can throw three other things out that were occupying the same space. But I never get tired of the Fender Tremolo - it's the sonic equivalent of a big mirrored ball. If I'm playing some­where that has a mirror ball I insist it gets turned on and I never get tired of it. It approximates movement and if you're a strummer like me, it gives the illusion that you're moving even if you're not. It has a great sound - like a pulse, like life. Classification is an unnecessary evil in the world of record shops. Do you find it annoying to be pigeon­holed in the 'Country' section? No-one in America calls me country - that's a very British thing. Country is a very specific thing in America, which I have no part of. I have a pedal steel player in the band and a violin player and that's kind of labelled me that over here. I find it a little bit irrelevant rather than annoying - I don't feel loyal to any one genre and I've never felt I've needed to be. Some critics have seen you as something of an archivist, sifting through various styles from the past. I'm not a traditionalist in any way. I've never been anti-overdubs or anti-sampling. I've worked in a live context for a long time, working like a primitive coz I didn't know any different, but I've never been offended by anyone else's approach to doing anything. I've never been purist that way. I'm not trying to preserve anything or reclaim anything. I think some of the songs, especially in the past, sound like they took place in an era other than this one, and maybe that gave some people that impression. It's easier to set songs in the past because the past is set in amber. It's like listening to this 80s tape - the 80s are over, we have that in a time capsule, we know what that feels like in our minds, It's easier to set a song in the 80s coz we know what that flavour is. It's like making a movie and throwing up a backdrop - you're already inferring a certain mood if you place a song in St Louis in 1950 as opposed to Detroit in 1987. It's a writer's gimmick! You've worked with some fabulous musicians. Was collaborating with Victoria Williams as inspiring as one would imagine? I found that pretty inspiring. When that happened I had just got to know her and it happened by fluke. She was at my house one day and I was going to record a duet with a female singer which I'd never done before and I was trying to think of somebody. I mentioned a mutual friend of ours who I was gonna call, not realising I was going to offend her greatly by suggesting someone else. She was like, 'well, I wanna do it!' I'm a big believer in circumstance dictating things and I thought, if she's gonna throw her hat into the ring, I'm willing to give it a whirl. It ended up being very musically appropriate -she sounded like a little girl's ghost. She's an inspiring person to be around, off and on. How about The Jayhawks? You had a mutually supportive relationship with them for some time. We have had for quite a while. I'm not working with them now - I saw one of their last shows as a band in LA, in fact I played with them -I just got up for a song. I didn't know it was one of their last shows but I wasn't surprised. For about three years there our lives were intertwined. We'd met through a mutual friend when I was leaving A&M and was looking for a way to tour cheaply as they were. We decided to pool our resources and they went out as my backing band and would open the show as The Jayhawks. I was smitten to work with them as a band coz I'd never played with a band which operated 'as a band' so I wrote the next album, Short Man's Room, completely with them in mind deciding ahead of time that this would be the band, this would be what it would sound like, so I wrote songs to fit the idea. We did maybe three more tours together, another record together and after Kindness of the World I felt I'd exhausted that idea - not in terms of what The Jayhawks had to offer but I wanted to establish some new sounds and make a record more rhythmic in its orientation. Those earlier records are more guitar records with lots of chord changes. How far are fellow musicians part of your intimate circle of friends? I know a few. I don't have as many peers who are musicians as you might imagine. I'm acquainted with a lot of them but I don't spend a lot of time with musicians. I was infatuated with my relationship with The Jayhawks for that very reason. I'd never before had peers who were musicians and it was really different for me to spend time, personally and professionally, with people who made records and toured for a living. That was contrary to my experience. I lived in New York -it's not a very supportive circle and I wasn't part of a scene. It was very cutthroat. I know a more friendly bunch in LA. I've met a lot of people through T-Bone Burnett over the last few years. I've got acquaintances who are musicians - I see Paul Westerberg infrequently, I've known Soul Asylum a long time - but I don't hang out with other people who do what I do for a living. The two songs you've covered on your last two records - Tom T. Hall's I Flew Over Our House Last Night and Sly Stone's Let Me Have It All- are very different. What drew you to those songs? In both of those situations it was something of an accident. I'm a pretty firm believer in retrospect that the right cover can tell you as much about a songwriter as anything you write. I remember The Band did Long Black Veil on their first album and that was as much a statement of purpose of what they were about as anything they wrote. The Tom T. Hall song on the last record was something I had learned - Gary Louris had a road tape and I'd always liked Tom T. Hall but hadn't heard that song before. We were in Kansas City and he was playing it in the van - I thought it was such a great song. I thought it actually worked a lot like a Raymond Carver story and we recorded it in New Orleans after coming back from dinner and a couple of Martinis, thinking we were done working for the day - we didn't record it thinking it was gonna be on the record. With the Sly Stone song, I was listening to a lot of Sly Stone over the past two years. I recorded that in my garage one day just trying to clear my head. I think I was stuck on another song that wouldn't be beat into submission and to try and get away from it I just recorded a drum machine part and a bass and a vocal. As luck would have it, my friend Page Hamilton happened to be in Los Angeles recording for a soundtrack and I invited him over one evening to play guitar on it, purely for sport, and only much later did I think of it as a piece of the puzzle, that I recognised that it lyrically and sonically fit with the record. I just assumed it was a catalyst for Page and me starting to work together and I brought him back to do a few more days of recording. But it was much, much after the fact. Are there a lot of stray songs left over from the album? I started working from that perspective. Writing with an acoustic guitar you subconsciously build in all the movement you imagine musically in the song, creating a little narrow path that everybody has to follow you down. Starting from a rhythmic standpoint, getting a good groove going, you realise how little has to happen for it to stay interesting and how much freedom that gives you as a singer. It's startling to realise I'd got to this part of my life without having learned that lesson. Does the motion in the music reflect the motion in the lyrics? There's a lot of movement lyrically - lots of cars and aeroplanes in particular. My knowledge of that would be instinctive - though it makes sense to me when you say it. I've written a lot when I'm travelling and somehow being away from home and away from what's familiar and feeling disconnected from everyday life is very conducive to writing. I've always written well on a plane - you feel kind of detached. It's like you're viewing your life and everybody else's life from the air, and you float above it. Being away from what's familiar to you is kind of hallucinatory. Speaking of hallucinations, do you have an anaesthetic of choice? It was always coffee! That's the only drug I've ever abused. I'm not drinking it right now. I haven't had a cup of coffee in three years. But I plan to return to it one day. Plenty of caffeine in that [indicating Joe's king-size bottle of Coke]! Yeah, I still dabble in caffeine! I've always enjoyed that. And I certainly enjoy a fair amount of red wine. I'm an Italian by marriage and that's kind of infiltrated my existence a bit. I think you're right. There's a time in everyone's life when you feel you're driving the bus and you're just hanging on to it. I think most of the characters in the songs, in the new album especially, are just hanging on. Certainly a lot of them are having some problems with gravity. How did your forthcoming contribution to Sweet Relief II come about? I'm a big fan of Vic Chesnutt. I'd never met him before and someone I know well was going to be the executive producer on the album. When I first heard it was happening, I sent a postcard saying I'd love to sing Guilty By Association. At that moment I was quite infatuated with that song. I didn't know what it was about, I just thought it had a beautiful melody, and he used the word 'Sharpie' in it and I thought that was the greatest thing I'd ever heard. Only later did I find out that the song was about Michael Stipe and the albatross is Michael's celebrity in relation to Vic. The song is about all the people that come to touch the hem of his garment because he's been in the presence of Mr Stipe. He had Michael sing backing vocal on his version - apparently without Michael knowing what the song was about! When I innocently asked to sing it, Vic's manager called us back and said 'Great. Why don't you get Madonna to sing Michael Stipe's part?' We all had a good laugh over it but as I thought about it, I thought the irony was pretty rich. It wasn't my record, I would never have done that in support of one of my records, but being a charity as it is, and since my sister-in-law sells a couple more records than I do -at least in my country, I don't know about here - I said I was willing to make a phone call. She'd never heard of Vic Chesnutt, as you may imagine, but she thought the song was quite lovely and agreed to do it. It put a different spin on it. It's certainly bringing her up in conversation a lot morel I used to get it all the time. It was almost going away and then I very naively opened the can again. It's fine though because I now have a professional answer to the question, whereas before there were always questions like 'have you ever seen her naked?'... which I have not, by the way. What music inspired you to learn to walk? It was probably Johnny Cash or something. I remember the first three 45s I bought which are still records I really love - Dusty Springfield's Son of a Preacher Man, Glen Campbell's Galveston and Elvis Presley's In the Ghetto. All really great pop records. When I returned to them in my 20s I was shocked by how good my taste had been at such a young age. Now I listen to a lot less music as entertain­ment the more I'm working. But I find myself listening to music that has a lot less to do with what I do. I love singers who don't sing in English. As a writer, I have a bad habit where my mind just goes to how the lyric operates. I'm learning to hear voices as musical instruments, the phrasing and rhythm and texture within the voice. I love Cesaria Evora, a Cape Verdean singer. Really smashing. A lot of Jobim, Sly Stone, early 70s Stevie Wonder and a certain amount of Frank Sinatra. As far as my contempo­raries go, I quite like the Sparklehorse record. People send me stuff all the time but when I'm working and on the road and have a family I haven't time to immerse myself in whatever's going on. I'm listening to Throwing Muses because I'm working with their drummer right now and I was ashamed that I didn't know more about what they do. I've become friends with Kristin Hersh in the past six months and she put me on to her drummer - David Narcizo is a fabulous player. Peter Blegvad suggested the question (not for you specifically, of course): have you devised the method of your own death? I'd like there to be some kind of drama involved. Who wants to go out looking at a vase of flowers when you can go up in a fiery ball? I suppose some kind of welding accident would be appropriately dramatic. Does Peter Blegvad have a new record out? I've heard a few of his songs and they've totally knocked me out. I remember hearing Syd Straw singing Gold and being totally floored by it. I thought it was so lovely and sad - it reminded me of a silent movie, big and flat. Have you guys seen Fargo yet? It reminded me of that open, desolate, windswept thing. When I wrote Flower Girl, that was my attempt to one-up Gold coz I imagined this guy was out looking for gold and not finding it and getting mad and bitter that he'd squandered his resources. But I thought Gold was beautifully eloquent. I don't have a recorded version - I may go and buy it while I'm here. But I've spent all my money on Cuban cigars which will be confiscated by the officials when I get home. The US is the only place in the world you can't buy Cuban cigars -we've had an embargo on them since 1959. You can't buy them legally, you have to have good connections. If you can buy crack in the States, you should be able to buy a good Cuban cigar. Where did the opera strain in Flower Girl materialise from? I'd recorded my first version of that song as a country song in New Orleans and was very irritated by it. It didn't work. It was innocuous and went by like a blur. I put down a minimal pump organ thing for it and then forgot about it. I got back to Los Angeles a month later and was in the studio with the engineer. He started with a Vari-Speed drum loop which sounded like an army marching and the pump organ and my vocal only. Everything else went out the window at that moment. I was trying to get to something like a Bunuel movie where things came in and out of view like when you're riding a train or in a car and things come into field and out with no precedent for it. Something blossoms and then fades completely. That evening we started playing with samples, which I can't really refer to because we have no clearance for them, but I'm going to tell you young fellows… we had this old Spanish opera record in the studio and were sampling it in the most primitive way - we dropped the needle and got lucky a few times. It made the song three-dimensional for me. It had its own life from then on. I instinctively knew it was the right thing to do. I'd never played with samples before because I never had the tools to do it. It was like making collages and cutting up a magazine, having these little events that happen. I'm probably as proud of that song as I was with anything on the recording - I was delighted with the tone of it. Do you think your bottle of Coke is half-empty or half-full? I've always regarded myself as a 'closet optimist'. A friend of mine used that term and I thought it fit me really well. People assume from my songs that I'm a very cynical person but I'm not at all. I can be very melancholic but I'm a relentlessly romantic and optimistic person. I think a lot of the characters I write about are not so much cynical but maybe mired a bit. But as people we certainly spend a lot more time agonising over our failures than celebrating our victories. As a writer it's natural to find it more interesting to examine where things went awry. Songs like that age so much better. One For My Baby's gonna last a lot longer than Good Day Sunshine... trust me! Does it concern you when folks can't see the humour in your writing for the black light you cast it in? I think all my songs are funny. I can't remember writing a song where I didn't think something about it was pretty funny. Most people who choose to talk to me about what I do find my songs dark and dour and relentlessly bleak but I think they're really funny. I think all the best, the most timeless art in the world has an element of humour in it. Fellini's bleakest, darkest films are incredibly funny, as are Werner Herzog's and Wim Wenders'. Just finding a really strange second line that will run pace with it and rhyme at the end - I find it really funny that words can work that way. It's like a pun to me. Just the fact that two ideas can finish in the same spot- I'm delighted by things that work that way. I'm glad you think they're funny. 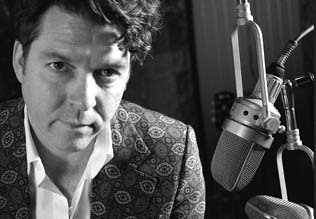 If you didn't spend your time being 'Joe Henry', what other occupation would suit you best? I'd be a UPS man. I love the mail. Nothing makes me happier than to get personal mail. Otherwise, I can't imagine what else I'd be doing-I was doing this before I ever thought I'd have to decide what I was gonna do. The day jobs I had were always just to survive until I could get from there to here-I never quit what I was doing to start doing this. I never had a Plan B. I always believe if I had a Plan B, I would've used it. If you give yourself something to fall back on, you'll always fall back. I tried to give myself no choice but to succeed. Otherwise, I firmly believe I'd be delivering mail.